Industrial organization, economics of technological change, science, technology and innovation policy. 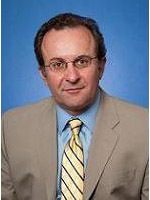 Nicholas Vonortas is Professor of Economics and International Affairs. Vonortas joined the Department of Economics and the Center for International Science and Technology Policy (Elliott School of International Affairs) in 1990. During 2001-2012, he has served as the Director of both the Center and of the graduate program in International Science and Technology Policy. Professor Vonortas received his Ph.D. and M.Phil. in Economics from New York University (USA), his MA in Economic Development from Leicester University (UK), and his BA in Economics from the University of Athens (Greece). Professor Vonortas’ teaching and research interests are in industrial organization, in the economics of technological change, and in science, technology and innovation policy. He specializes on strategic partnerships, innovation networks, technology transfer, technology and competition policy, and the appraisal of the economic returns of R&D programs. Professor Vonortas is an editor of the peer reviewed journal Science and Public Policy (Oxford University Press). Professor Vonortas has held visiting appointments at several universities including the University of Maastricht (Netherlands), Luigi Bocconi University (Italy), the Athens University of Economics and Business and the National Technical University of Athens (Greece), Fundação Getulio Vargas (FGV) (Brasil), and the University of Lund (Sweden). He has served as a consultant to many government agencies in the United States, the European Union, the Republic of Korea, Japan, and Mexico and to several international organizations on issues related to strategic partnerships, R&D program evaluation, risk investing, science and technology indicators, innovation systems, and industrial competitiveness.